Barr Specialty Tools based in Idaho, USA was started in 1977 by Barr Quarton, who has learnt how to create really fine quality hand edge tools that are respected and appreciated in America and are now also available in the UK through Classic Hand Tools. 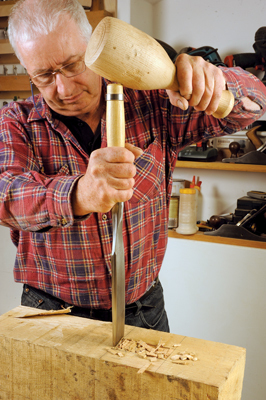 This monster is a very different kind of tool, not a chisel, but a very wide slicing and paring tool intended for large-scale timber framing work. It has a flat underside, unlike the similarly sized 'Scarf Slick', which has a mild sweep to its profile. The tool arrived with an almost ready-to-go edge, but I took my 1,000 grit diamond plate to the tool rather than the other way round. That and a bit of stropping gave it a razor-sharp edge. It is worth noting that compared to mass-manufactured edge tools, this one had a flat back that didn't need further work, a sign of the intrinsic build quality of this 'made-for-life' tool. It is a big and satisfying piece of kit to use and, used correctly, it will clean the faces of beams and big tenons. As the name suggests, this beast is intended for heavy framing work, chopping out mortises and cleaning up bridle joints. Perfect for working on oak (Quercus robur) frame timber buildings, for example. The chisel backs have a high degree of flatness just cresting a fraction at the leading edge, where in fact you need both meeting faces to come to a clean cutting edge. Only slight preparation with a diamond plate and a strop were needed to bring this to a work-ready state. The upper face has an unusual downswept curve, which aids levering and like the bench series, has a part bevel on the edges while keeping a basic perpendicular edge profile. The steel hoop on the handle gives plenty of assurance when belting it with a heavy mallet. In the UK this over-length model would probably qualify as a joinery chisel, simply because - although it may be for bench use - it depends what you intend on putting on the bench! 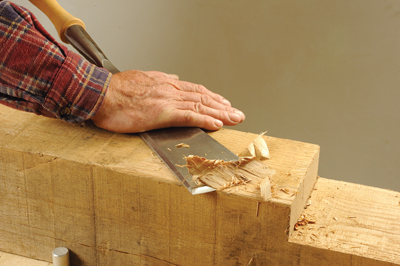 I suspect quite heavy sections, that need some effort put behind any joint cutting. 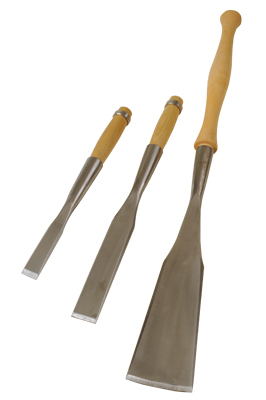 These chisels are unusual in having socketed handles at a time when mass-produced chisels have tangs instead. The socket is unbreakable, so if a handle ever fails it is easy to replace it. However, the striking hoop should keep it together, even with heavy use or abuse. By comparison to the overall length of the tool, the blades are shortish and have a similarly downswept top face and perpendicular sides, plus a part bevel profile. The backs are very flat and the whole tool well produced. I haven't been able to try any other tools by Barr Quarton, but the quality of these edge tools is phenomenal. They retain a handmade, individual feel, combined with attention to quality and precision. I can see why customers in the USA are so smitten with them. If you have a need, these will fulfil it.